It happened. I am officially addicted to making ice-cream in my Vitamix machine. It arrived about six weeks ago by courier. At first I didn’t think that it would become such a staple in my life. It’s a high-powered blender, after all. Black, with two mixing containers: a wet one and a dry. I’d heard my step-son and writing colleague praise the blender with Messianic fervour (read here on how to make a date shake). What’s wrong with these people, I thought. 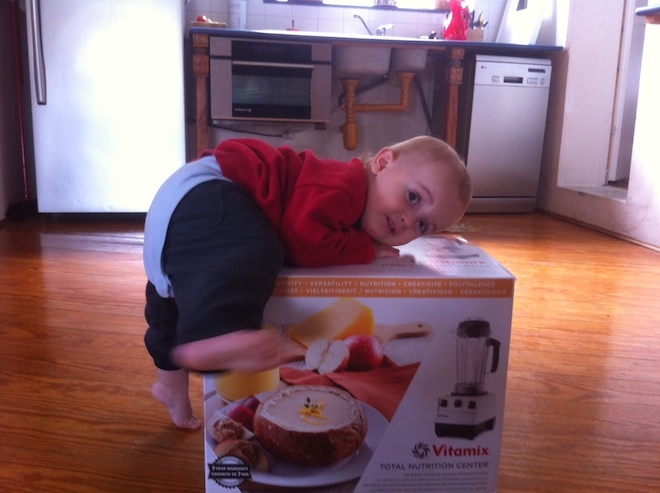 They are getting excited about a blender? But I was wrong, so wrong. This machine is an earth-loving, green girl’s fantasy. It’s one of those machines that can replace every other machine on your counter. It gives you the option to make green shakes, juices (but can be messy), ice-cream (yes! ), your own ground coffee, home-made and home-ground organic baby formula, vegan pate, fresh tehina, and a pot of soup right in the blender. Apparently there are stages of addiction with the Vitamix and I am at the first stage: ice-cream. The addiction doesn’t go away, apparently, but it changes form. Within 24 hours I’d made and eaten five kinds of ice-cream, all of them 100 percent vegan and 100% sugar-free. And boy was it delicious. You have to know that I am neither a vegan nor do I strive to be sugar free. These two benefits are byproducts of my addiction. This is coming from a girl who will eat nothing less than Baskin Robbins, and if given a choice will only eat Hagen Daaz. I will supply a recipe that emerged from my addiction below. You can try it in a regular blender (the folks that don’t have a Vitamix), but it probably won’t work. The truth is, my husband is watching his sugar intake and his health. And now we have two little kids that shouldn’t eat sugar. And there are a few reasons why the Vitamix blender takes the cake. The size of the motor is apparently strong enough to crush stones, according to my step-son. At a workshop I was on at New Horizon in Israel (one of the only places where they are available in the Middle East), the machine can actually process dried chickpeas. Mixing hummus that’s cooked is a no brainer. The fact that the blade is non-removable from the container means that it is a breeze to clean. This is a top point for someone as lazy as me. I love to cook but I hate to clean. A few cups of hot water, some drops of soap, a whirl around the engine and the Vitamix is clean. The last blender I bought died when I was making a milkshake. The three-minute blend was too much for the machine and it died, puking out a terrible smoke. It almost caught fire when we found it smouldering later on. The Vitamix has a special switch that prevents it from heating up. If you are making too many almond butters or ice-cream (he, he), it will switch off before you can do any damage. With a 10-year warrantee, I may be willing this machine to my kids. But there is loads of cooking to do before then. Over the next months I plan to take on some traditional Middle East cooking projects using my Vitamix. It can freshly grind flax seeds, for instance, but how will it handle hard hummus beans, making fresh tehini or my own secret falafel mix? Until then, I am offering you my favorite ice-cream recipe, after five different tries. Blend all the above together (leaving out the ice) on high speed, using the black rod that comes with the machine. I don’t know what it’s called, but it’s very essential to have this thick magic wand in action while the above ingredients are grinding. Push it into the sides as the machine runs on turbo. After about 40 seconds grinding with some uniform consistency achieved, add in 2 cups of ice. Then get the black wand ready to start mixing. It takes a bit of effort, but it’s worth it. After about another 40 seconds round you’ll have the finest tasting gelato-like ice-cream you’ll ever find on this planet. And the health benefits? Don’t get me started. For Jewish chefs the result is kosher, pareve. For Muslims, it’s halal. For vegans, it’s vegan. For raw food lovers, it’s raw. For sugar addicts, it’s a more natural way to get your sugar high. Top it off with some crunchy granola and you’ll find heaven on earth. Even if you replace any of the ingredients above with something else similar, you probably won’t go wrong. Don’t try onions, for instance. But if you don’t have bananas, try a frozen orange. If you don’t have coconut, try raisins… the list goes on. My step-son tells me that after the ice-cream addiction stage, I will probably move on to green shakes. Honestly, I’m already jones’ing for one but we don’t have any apples left from all the stuff we’ve been making over the weekend.